DPX Systems seems to deal exclusively in devices powered by handheld drills. In addition to the mini bike in the video above, they’ve made systems for wheelchairs, toolboxes, and hoists. The device costs $630, but we know most of you just need prompting that something is possible to be well on your way to building your own version. We’re still more fond of weed whacker machines. Today Black Hat held a preview webcast with [Dan Kaminsky] about the massive DNS bug he discovered. On July 8th, multiple vendors announced a patch for an undisclosed DNS vulnerability. [Dan Kaminisky] did not release the details of the vulnerability at that time, but encouraged security researchers to not release their work, if they did happen to discover the bug. On the 21st, the full description of the vulnerability was leaked. In today’s webcast, [Dan] covered how he felt about the handling of the vulnerability and answered a few questions about it. He started out by talking about how he stumbled across the bug; he was working on how to make content distribution faster by using DNS to find the server closest to the client. The new attack works because DNS servers not using port randomization make it easy for the attacker to forge a response. You can read the specifics of the attack here. [Mark] sent in this nice trick for breathing new life into an old laptop. [Sarc] had a tibook with a broken LCD. It was still usable with an external monitor, so he simply removed the broken LCD. The tibook (and MacBook) uses a magnetic sensor to monitor the LCD position. To put the machine in the right mode, he taped a magnet in place to make the machine think that the display was in the closed position. 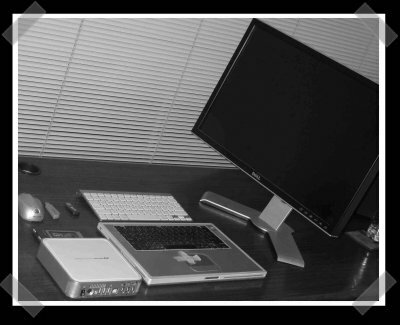 To really clean things up, he mounted all the hardware under the desk and used a wireless keyboard and mouse with the machine.